Everyone will tell you that the secret to pool is in the follow-through. It's rare, though, that folks are kind or knowledgeable enough to give you a practical definition of what follow-through is, let alone how to assess whether yours is good or not. Simply put: follow-through is where the stick goes after you hit the ball. If you stay down and leave the stick where it lies after you shoot, you'll gather visual evidence of your own follow-through. You'll surely miss your shots if you're looking back at your mechanics while shooting, so using the stick as your guide is the easiest way to see where your fundamentals are going wrong and to tell if your attempts at improving them are working. Frank Says: "The OB Digicue Bluetooth Training Aid is a great tool to help check your stroke for a better follow through!" The drill couldn't be simpler... put a ball, any ball, on the foot spot. Using your regular shooting routine, pocket the ball directly into one of the far corner pockets. There is no object ball to hit – it's as if you're scratching directly into the pocket every time. Simplifying your task by removing the need to hit an object ball allows you to devote more attention to your follow-through. 1. Where is your pool cue stick pointing? At the end of your shot, your cue should be pointing in a direct line towards the pocket. For every action there is an equal and opposite reaction and all that jazz, so it stands to reason that if your stick ends up pointing to the left of the pocket, your hand swung out to the right instead of in a straight line. 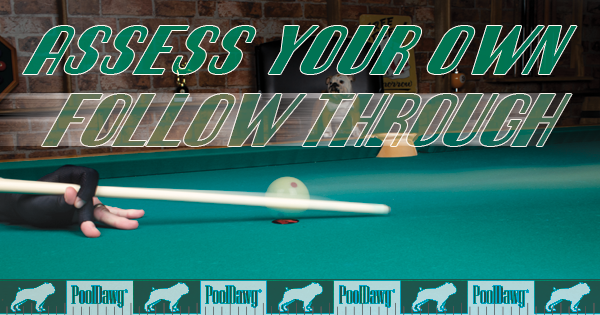 Instead of rushing to stand up after your shot, stay down and take a good look at where your pool cue is pointing. If it's pointing straight towards the pocket, you followed through correctly! You also want your stick to point down towards the cloth of the table, or to have the tip of your stick be resting on the table, at the end of your shot. If your tip ends up rocketing off into mid-air, it means that you are dropping your whole arm instead letting the hinge of your elbow do the work. Again, pause here after taking your shot. Did you stop too soon and is your cue hovering above the table? Or is the top of your cue pointing down and touching the table? 2. Did your pool cue come forward smoothly? If you see any wiggling, vibration or stuttering as you hit the ball, chances are your hand is either hitting your body (a side-to-side wiggle) or you are clenching your grip hand during the delivery of the stick (an sharp upward stutter). 3. How much of your pool cue went past where the ball was? The ball started on the spot, so it's easy to measure how much of the stick followed through. Ideally, your stick should come at least 4-6 inches through where the ball was. In order to accurately measure how far you are following through during your shot, try putting a ruler on the table. If you're below four inches, try a bigger follow through on your next attempt. If you exceed six inches, try holding back a bit to make sure your shot goes where you want it to. Quite a few things can cause a shortened follow-through. Clenching down on your grip mid-stroke will stop the forward movement of the stick prematurely. 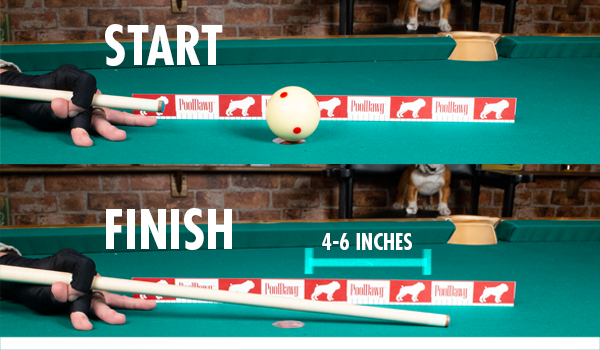 Lining the tip of the stick too far back from the cue ball at the beginning of the shot will make you feel like you're reaching to hit the ball instead of accelerating through it. And having the stick too close to your body will give your hand (which moves the stick) no room to move forward after hitting the ball.